Well, it hasn’t been that bad of a winter, but, even so, potholes are back. Cresswell is really badly affected. The most vicious pothole is at the collapsed drain-cover on the southbound bank, up to the cricket club. As it’s on a slope it’s hard to see it, until you hit it – often with a nasty crack. 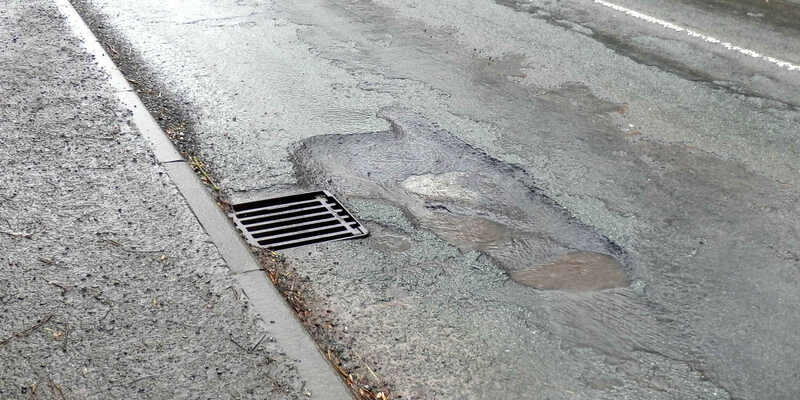 Meanwhile on Sandon Road, at the point where traffic enters & exits off the business park, numerous little potholes have appeared, making the road all pitted. It’s the effect of all the HGVs coming and going off the park, of course. 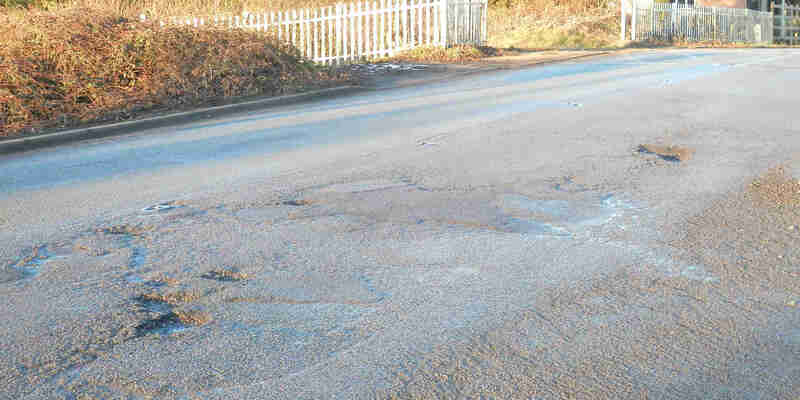 Potholes on road outside Blythe Business Park in Cresswell – looks like the surface of the moon! And it will only get worse if the developers/owners of the park get their way and planning permissions are altered to allow them to use this entry for construction wagons too. (A decision on that is expected in April). For over twenty-five years, Draycott has held a successful summer fayre. All the work that goes into it is by local volunteers, and all the profits (which average around £5000) are ploughed back into maintaining the crumbling fabric of our ancient church of St Margaret’s. Because we have lost our school, our shops, even our football club, there are very few occasions now when the village comes together to celebrate together – this event is virtually the last. So – it wouldn’t be a good thing if the fayre did not happen. But that is what is possible. Because… a lot of the people who put in the effort year after year say they are getting on – and they now want to hand over to new blood so they can just take a rest! Fortunately for us, John Clarke has agreed to stay on as Coordinator, so at least there is still a steady hand at the helm. Can YOU help? From just looking after the car-park on the day, to selling raffle-tickets, to making phone-calls – there are a range of tasks from the small to the significant. Railway Cottages Lane in Cresswell is a bit off the beaten track, but a few people have been down that way recently – partly to check out Number Four (which is currently for sale) and partly to look into a planning application site there (the plans have since been turned down). Part of that planning pre-process was the creation of a new track on the site, which, by chance, has uncovered a lovely industrial structure, part of Cresswell’s history: a rail platform for goods loading. Cresswell Railway Station, which was over 100 years old when it finally closed, was at the junction of the Stoke-Derby line and the Cheadle Branch line. It closed to passenger traffic in 1966, but stayed open for industrial traffic (carrying mainly sand from Cheadle) for another twenty years. The uncovered structure is part of a small goods yard handling such freight. Matthew Pointon, the historian of Draycott, thinks that he remembers that the platform was actually inside a large goods shed, which was demolished in the 80s or 90s. The new track is private property, but you can see the platform easily because the new track is right next to the lane. Nice, isn’t it? The elections for Draycott-in-the-Moors Council are just around the corner – May in fact. But first we need at least seven candidates to stand for election; signed nominations must be in by the beginning of April. This year, more than one councillor on Draycott Council has spoken of standing down and not seeking re-election. Though it’s not a particularly tough role, or even requiring much to do, still, it’s a responsibility – and some of the current members have been doing it for many years, so they think it’s time to hand the baton on. So… are YOU interested? There’s a quick run-down on whether and if you’d be eligible by clicking here. As you will see, you don’t even have to live in Draycott / Cresswell / Totmonslow to be eligible…! The first thing to do though, if you are interested, is to make sure you are on the Electoral Register (though it doesn’t matter which county you are registered in, so long as it’s somewhere in the UK). That’s essential. If you’re interested in the tiny ins & outs, you could attend the special meetings in Leek on Wednesday 6th March and on Tuesday 12th March, but it’s really not essential. If you think you’d like to give it a go, contact the Draycott Council Clerk who will be able to give helpful advice. And the best of British luck!! Want to comment on any of the items on this page? 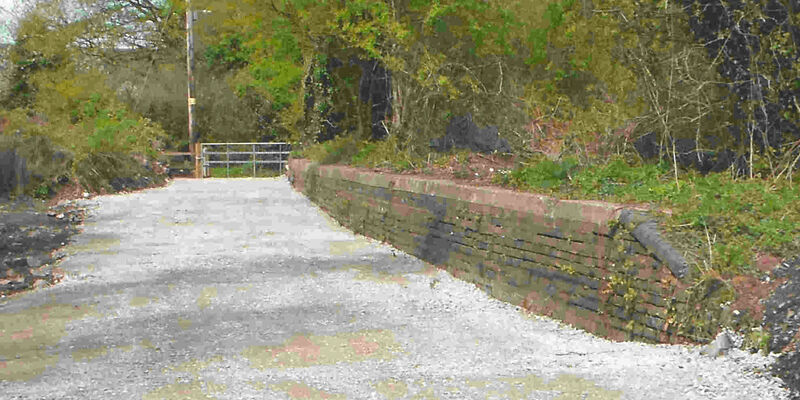 Things have been a bit quiet for the Friends of The Cheadle-Cresswell Railway Path over the last six months. The group formed in July last year, and had a good summer, with the volunteers raising funds, clearing some of the undergrowth from the path and doing some path-laying. However there has been no meeting since November. 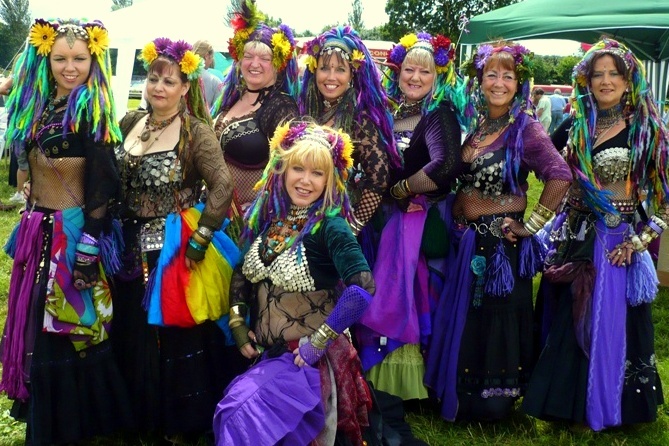 But, the group’s secretary Oliver Griffiths, says the return of the good weather will see the resurgence of the group. All, says Oliver, that he is waiting for is some permissions from the leaseholder of the path and from some adjacent landowners. And then meetings will re-start. All are welcome; just keep an eye on the group’s Facebook page for more info. For those that have forgotten this story, our old branch rail-line, which went from the centre of Cresswell, via Totmonslow, right up to Cheadle, is now mostly a ‘permissive’ public-path/greenway, available to walkers and horse-riders. The path was nominated as such in 2012 – see our archive report. Nine-tenths of it is open to the public (see article on the other tenth). This line was once a very busy route. A local industrial company headed up by a man called Robert Plant was the first to get the project properly underway in the 1880s – in those days, most railways were built by entrepreneur businesses, not by the government. The idea was to construct a track which would leave the main Uttoxter-Stoke line at Cresswell, swerve north-eastward to Totmonslow where there was a small station, and then go north to Cheadle. It would carry not just passengers, who could then reach Stoke (or Derby) via Cresswell, but also transport freight – coal from the Draycott Cross pits. Building started in 1888, when the first sod was cut in the April of that year by Edward Plant, Robert’s son. Within just a month a quarter of a mile had been laid, but, with subscriptions coming in slowly, work kept stopping. It wasn’t until four years later that the first section, from Cresswell to Totmonslow, was completed! Finally, thirteen years after the commencement, the full line to Cheadle was completed. Less than seventy years later, in 1963, the line closed to passenger traffic, though it did keep open for freight for a while. The full story of the railway can be read in the Cheadle Branch Line Wikipedia entry. Very few signs that the line once existed are still there. The rail-tracks themselves were lifted five years ago, making the way easier to use for walkers. However, the old Totmonslow station building remains in the form of a cottage ‘The Ranch’. You can also still see the ruined station platforms at both Cresswell and Totmonslow. Cresswell Station House was pulled down around the early sixties, but for a while before that, had been rented out as a home. 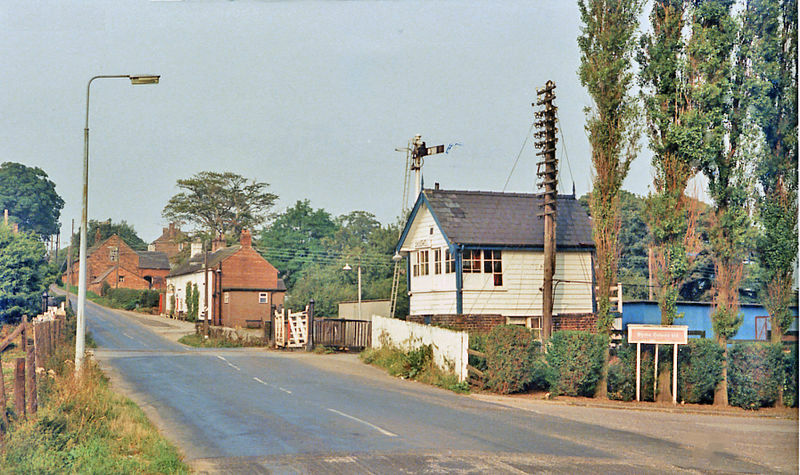 The local historian for Tean, Ivy Willetts-Brunt, remembers that, in the 1930s, her cousin Jack used to go daily to collect cold fish delivered to Totmonslow Station (by then also known as Tean Station). It was needed for the Tean Fish & Chip Shop! Also, some more anecdotes and stories about the use of the line would be good. For example, we were once told that the station house at Cresswell was once rented out to the well-known sixties pop-group The Marauders. Is that really true? Please use the comments box below…. This week’s edition of the Cheadle Post has something of an exclusive for the paper. It reveals that it has managed to obtain some previously confidential documents of Moorlands District Council meetings. These documents reveal which places across the district are being considered for future traveller/gypsy sites: as well as two in Blythe Bridge and one in Forsbrook, a parcel of land in Cresswell is also on the list. According to The Post, the ‘former site of Cresswell Railway Station’ is being considered, a description which could mean the overspill car-park by the level crossing, which is near where the old signal box stood, or it could mean further along the line, near Railway Cottages. It’s not clear. The Moorlands District Council is in a quandary, as it does have an obligation to provide traveller sites – but it faces objections to most of its preferred choices. The council seems to be opting for smaller locations though – ones holding perhaps only three or four caravans – which might be why the one here in our locality looks attractive to them. It’ll be interesting to see what the reaction is. Last week’s Draycott Parish Council meeting heard that the petition asking for a pedestrian island somewhere in the middle of Uttoxeter Road (probably near Stuart Avenue) collected nearly 400 signatures, nearly all of which came from Draycott residents themselves. It is of course a very busy, wide and open road there; and, despite there being a speed limit of 40mph right up until the A50, the fact is that traffic really does bomb along there. During rush hours, crossing the road can be quite hazardous. The same report indicated that well over a thousand vehicles an hour pass along that stretch. The petition will eventually be handed on to our district councillor, Mark Deaville, with the hope that he will take it along to the county council highways people. 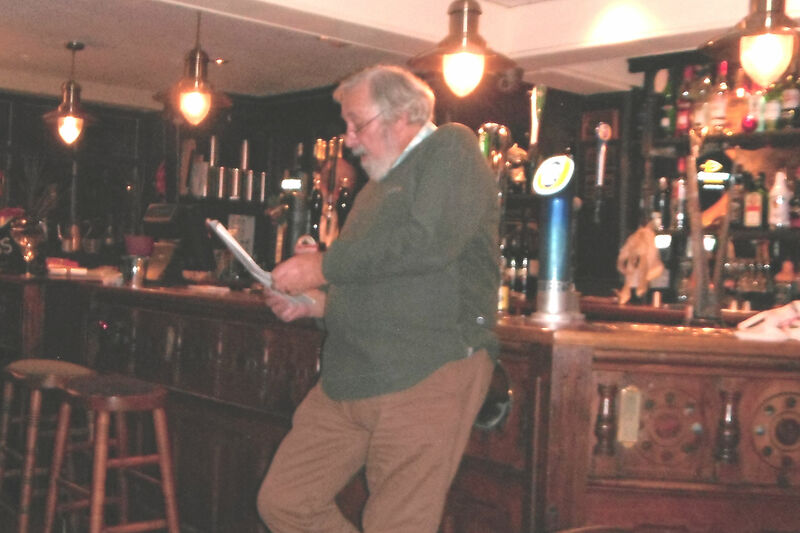 The Wednesday night pub quiz at the Izaak Walton Inn raises money both for the local First Responders and for a fund to install a public-access defibrillator in the village. It’s proving very successful in doing both – the defibrillator fund, organised by the VVSM community group, now stands at over £600, which is more than halfway toward the target. The defibrillator fund was boosted this week by a sum over £60, collected in response to a very special event. As a one-off, the forty people in the pub were all treated, at the quiz interval, to a rendition of the poem ‘The Death Of Nelson’. The bullet pierced his heart, and Nelson fell down with a shout. “Kiss me Hardy!” he whispered aloud (because there was no one nicer about). Thanks very much to the reciter, a well-known member of the Cresswell Speed Watch team, whom we shall always think of from now on as … ‘jolly Roger’! As we now all know, Mary Edwards has handed over the reins, as parish council clerk, to Kate Bradshaw. Mary had been in post for nearly forty years – and has seen the transition from typewriter & tippex to computer & internet. She has also observed the huge changes in the way that parish councils are being asked to work… so it really was the end of an era when she decided to step down. However, decades of service like that should not go unrewarded, so it’s good to hear that there will be a special event in her honour, and a presentation, in early January. Just use the comments box – near the bottom of this page. (The form will ask if you wish to put in your email address. You don’t have to – and it is always kept private anyway and never published -, but, if you don’t add your email, that means you might miss any responses to your comment). If you find the photos on this webpage too small to see properly, all you have to do is double-click on the photo itself, and it will double in size immediately.